Are you interested in social action or helping others? We have lots of opportunities waiting for volunteers. You can volunteer inside the temple. For example you can help make PB&J for the homeless. If you want to be involved with projects in the community there is plenty to do. 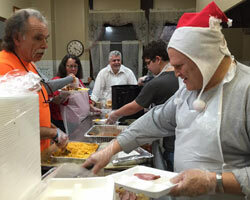 helping feed the needy in Cleveland at St. Aloysius or become involved in our Teddy Bear Bank. Temple Israel Ner Tamid has a long history of Tzedakah. 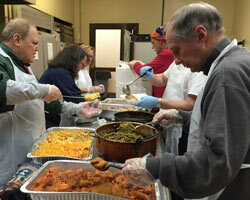 For over thirty years we have partnered with St. Aloysius in Cleveland to serve dinners on the third Tuesday of each month, including a Thanksgiving and Christmas dinner. 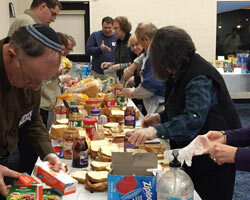 Peanut Butter and Judaism – Every week, since November 2008 we have made 150 – 200 peanut butter and jelly sandwiches each and every week. We then drive them downtown and hand them out to the homeless or deliver them to local shelters. 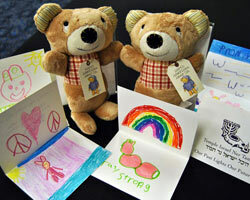 Teddy Bear Bank – We collect donations to buy new Teddy Bears to be shipped to police departments in areas affected by floods, storms and other disasters. Chesed Shel Emet – Every year after the High Holy Days we travel to a local Jewish cemetery to clean up the grounds. Food Pick-Up – Local restaurant Chick-fil-A and Panera donate their unsold food. Members of our congregation pick it up and deliver it to shelters, food banks and other charities. Blessing Bags – Congregants and businesses donate personal items, like toothpaste, deodorant and soap. These are placed in bags and delivered with the PB&J to those in need. Chanukah Gift Collection – Each year, before Chanukah we collect toys that are donated to Jewish families in need.